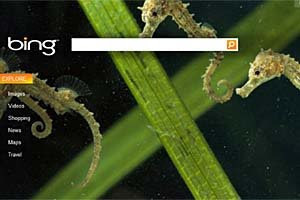 Bing, Microsoft's latest search engine, is starting to click with consumers, according to YouGov's BrandIndex. The index, which is based on 5,000 daily interviews over the Web, shows 25 percent of all U.S. adults 18 and over have heard something about Bing over the last two weeks. For Google, the figure is 52.5 percent. Microsoft broke ads for Bing in late May. The campaign, via JWT, New York, has been estimated to be in the $80 million to $100 million range. The media blitz seems to be raising awareness, if nothing else. According to BrandIndex, only 7.9 percent of consumers had heard of Bing on June 8. YouGov's data comes after comScore showed Bing had achieved 15.5 percent penetration among Web surfers for the period of June 2-6. Google's share gene rally hovers around 60 percent, per comScore. The Masses Are Learning What "Bing" Is (MSFT, GOOG)What's an $80 million ad campaign get you these days? For Microsoft (MSFT), advertising its re-branded search engine Bing, about three times better brand recognition in just three weeks. As of Monday, 25% of US adults over 18 have heard of Bing, according to the YouGov BrandIndex. That's up from 7.9% on June 8. During the same three weeks, Google's (GOOG) brand recognition hovered between 52.5% and 57.4%. YouGov comes up with their number after interviewing 5,000 people each weekday. The margin of error is about 2%.